Los Angeles, CA (October 29, 2017)– Alzheimer’s Greater Los Angeles (ALZGLA) held the popular annual fundraiser walk4ALZ® today, Sunday, October 29th. The two-mile walk started in Century Park, in Century City, traversed Avenue of the Stars, before returning to the park, and drew close to one thousand participants and supporters. A fun-filled morning for the whole family, walkers paraded in Halloween costumes and participated in the walk4ALZ costume contest. Fundraising from the annual walk4ALZ, generated nearly $400,000. All walk4ALZ proceeds benefit Alzheimer’s Greater Los Angeles. Special guests included: Edward James Olmos (Blade Runner 2049, Coco), Sharon Lawrence (Queen Sugar, Me, Myself & I), Kelen Coleman (Me, Myself & I), Larry Morgan (K-EARTH), Liz Hernandez (Wordaful), Susan Singer Carter (filmmaker: My Mom & The Girl). Liz Hernandez and Sid Garcia emceed the opening ceremonies and shared moving personal stories about how Alzheimer’s had impacted their families. Garcia noted the death of music legend Glen Campbell this year, who suffered from Alzheimer’s. Edward James Olmos rallied the crowd with an enthusiastic speech about the importance of local Alzheimer’s care as a resource to the Latino community. Hernandez introduced ALZGLA President and CEO, Heather Cooper Ortner, who thanked sponsors, and the special efforts of honorary board member Dr. Joshua Trabulus, whose walk4ALZ team Dr. T & Friends raised more than $62,000. Dr. Trabulus was presented with a Los Angeles Chargers football signed by Joey Bosa, #99, LA Charger’s Defensive End and 2017 NFL Defensive Rookie of the Year, generously donated by LA Chargers. Following the walk, Paula Rosado (Univision 34) discussed the unique challenges faced by Alzheimer’s caregivers and the importance of seeking personal respite and support when caring for a loved one with dementia. Sharon Lawrence and Kelen Coleman, who have each experienced the pain of a loved one impacted by Alzheimer’s and progressive cognitive impairment, addressed the need to support one another as well look for a cure. Concluding the event, special guests and volunteers announced the fundraising grand total in a suspenseful “reveal”. Walk4ALZ was generously sponsored and supported by Meridian Senior Living, KABC7, Univision, Home Care Assistance, Zenith Media, Century Park, and Wellbrook Santa Monica. Vendor booths and entertainment included a Halloween booth decoration contest, music, face painting, balloon art, food and beverages by The Stand. 100% percent of walk4ALZ funds raised stay local and will provide the wide range of free ALZGLA programming available to Angelenos living with Alzheimer’s, their families and caregivers. Twenty percent of proceeds will fund grants for locally based medical research into dementia and its causes. “Walk4ALZ is our biggest annual fundraiser and makes it possible to supply needed services free of charge to all those suffering from Alzheimer’s, their families and caregivers, living in Greater Los Angeles and the Inland Empire. The Walk is also a great opportunity to come out and enjoy a day of community fun and exercise. 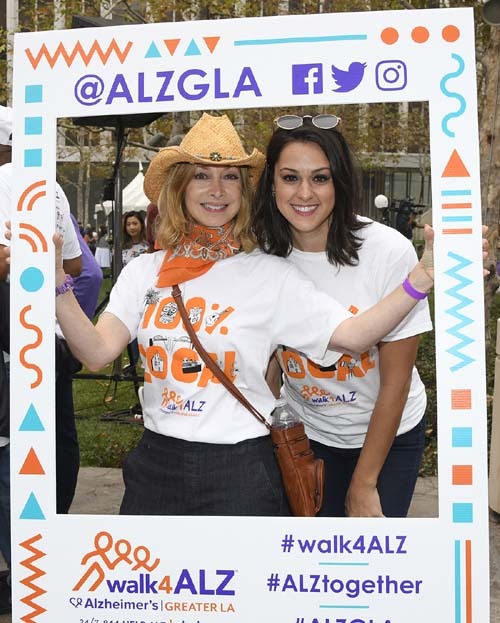 The entire ALZGLA staff looks forward to this chance to meet our clients and guests in a fun setting and raise awareness with the greater community,” said Heather Cooper Ortner, President and CEO, Alzheimer’s Greater Los Angeles. Alzheimer’s Greater Los Angeles is the only local full-service, dementia-focused, nonprofit with 36 years of experience and 5 locations serving Greater Los Angeles and the Inland Empire. ALZGLA provides programs and services free of charge to individuals with Alzheimer’s and related dementias, their families, caregivers and the community. Low cost training and education are also offered for professionals. Alzheimer’s Greater Los Angeles began as an independent 501(c)(3) nonprofit in 1981. 100% of all Alzheimer’s Greater Los Angeles fundraising stays local, focusing on care, support, advocacy, and research across Greater Los Angeles and the Inland Empire. Alzheimer’s is a devastating neurodegenerative disease that weakens the memory and other cognitive and emotional functions. For more information, call the Helpline 24/7 at 1-844-HELP-ALZ or visit www.alzgla.org.